The Detective Pikachu film is still over a month away but the tie-in Pokémon cards officially release in a little under two weeks… and we’ve actually seen English scans of all the cards. Some released as Black Star Promos, while others are from the Pokémon TCG: Detective Pikachu mini-set. In fact, we’re starting with one such card: Detective Pikachu (Detective Pikachu 10/18)! I mean, it would be strange not to begin with one of the actual Detective Pikachu cards. There is also Detective Pikachu (SM – Black Star Promos SM194), which is also receiving a review today. That’s right, today’s a twofer… because there’s going to be so much overlap, we didn’t want to stretch them across two days. As a reminder, Detective Pikachu is indeed the card’s actual, printed name. That means you can run it alongside up to four copies of Ash’s Pikachu, four copies of regular Pikachu, etc. It also means it cannot evolve into Raichu or Raichu-GX. Its [L] Typing lets it take advantage of some nifty tricks like Electropower, and [L] Weakness is found spread out among almost all the Types. Type-specific counters and Resistance exist, but are obscure and (I think) only found in the Expanded Format at this point. As a Basic Pokémon, Detective Pikachu requires minimal deck space and effort to hit the field. Detective Pikachu only has 90 HP; while not especially fragile, it is still a probable OHKO once your opponent’s deck has even a half-decent setup. Thanks to [F] Weakness, against [F] Types, the 90 HP is an all-but-guaranteed OHKO. A slight upside is you could fetch this card from your deck with Level Ball in Expanded. With just 90 HP, -20 from Resistance won’t mean much, but the [M] Resistance is still appreciated (and better than the typical lack of Resistance). Surprising me, Detective Pikachu has a mediocre Retreat Cost of [CC]. Detective Pikachu knows two attacks. For [L] it can use “Scout” to let you see your opponent’s hand… but attacking ends your turn, so your opponent can essentially “undo” your attack if they use up enough cards or use any shuffle-and-draw effects. 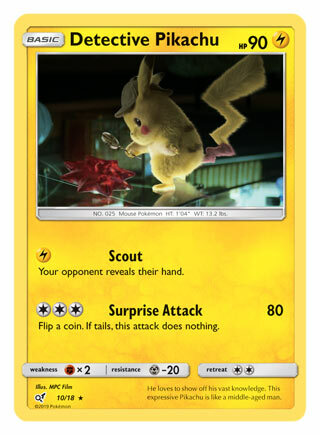 [CCC] pays for Detective Pikachu to use “Surprise Attack” to do a solid 80 damage but only half the time, as the attack requires a coin flip to use and “tails” means the attack does nothing. I can’t think of a good reason to use this card in the Standard or Expanded Format. It wouldn’t be completely useless in the Limited Format… but mini-sets don’t get Pre-Releases. I’m not sure you can even use them for a Sanctioned Limited Format event; if you can then I suppose has some potential as filler for your deck.